The one of the many things I enjoy about decorating for Christmas is unwrapping and displaying the different items and remembering the stories associated with them. 1. 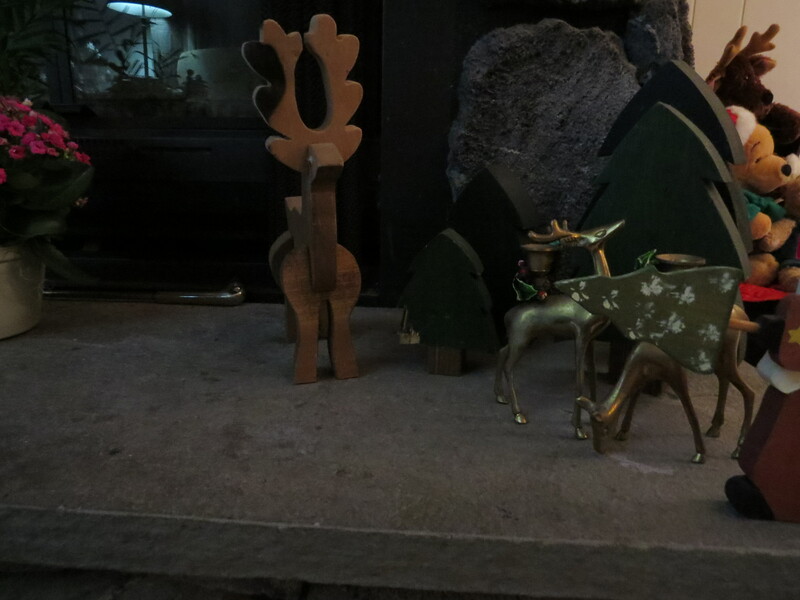 Some have funny stories like my handmade wooden reindeer, a gift from a student, that has burnt antlers because years ago Bruce accidentally threw the antlers into the fireplace. I walked in the room and said “what happened to his antlers” and there was a strange look, a fireproof glove and a hand reaching into the fire to retrieve it. 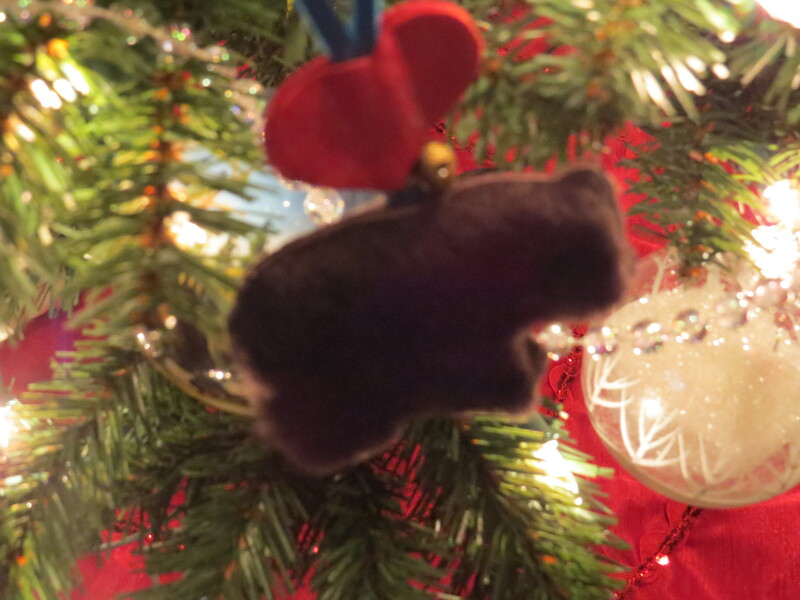 Or there is the slightly gnawed on wooden tree, a gift my brother-in-law had made, that the dog decided to eat. 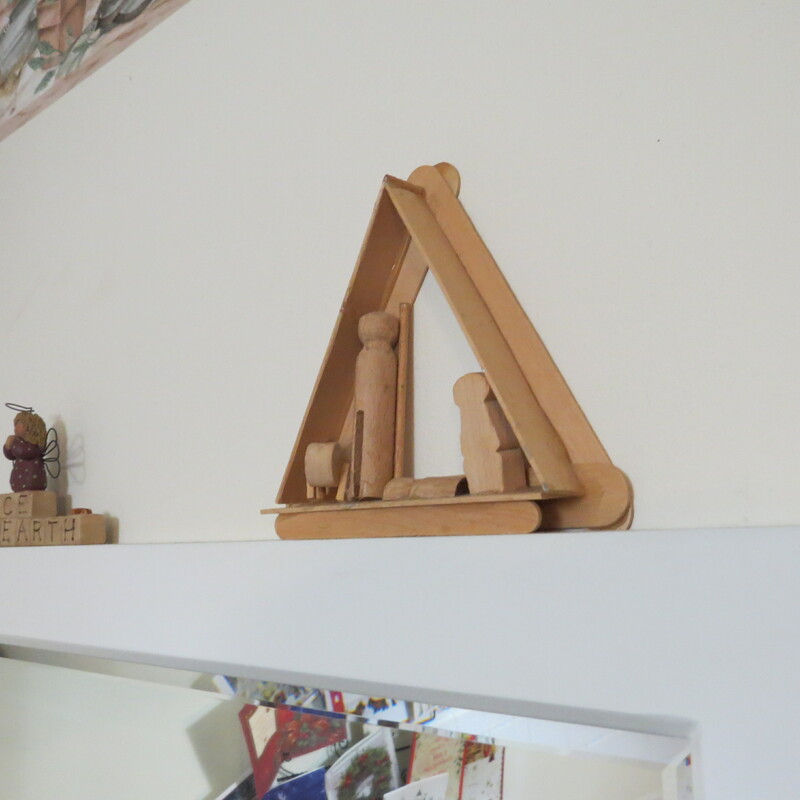 Others have sentimental stories like the adorable clothes pin nativity scene Emily made in elementary school. Yes, mommies save and cherish those projects. 2. 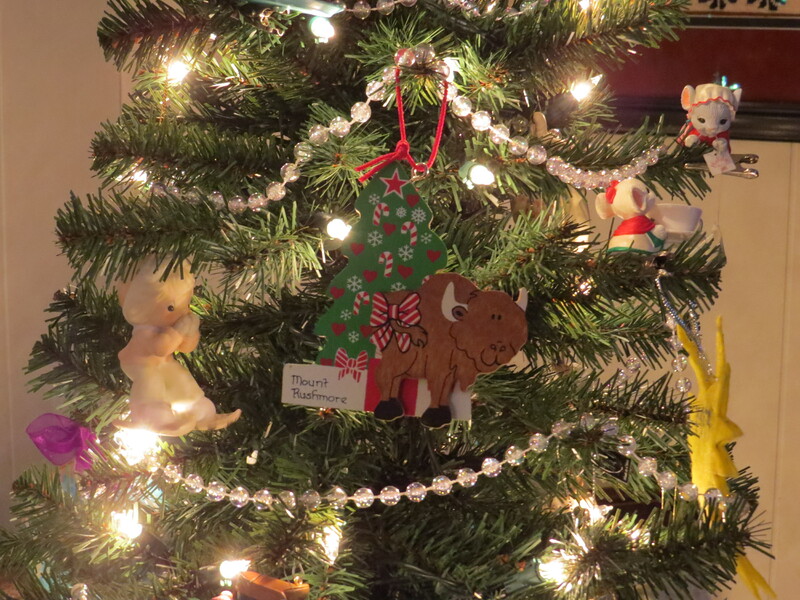 Some have travel/adventure stories like my travel ornaments. 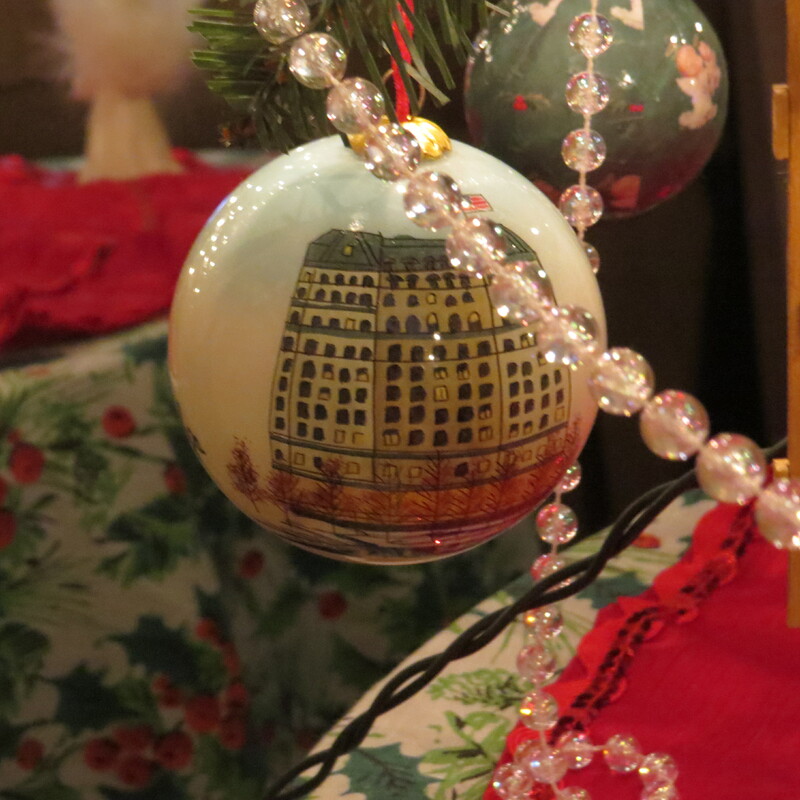 I personally think that ornaments are the best kind of souvenirs so my Christmas tree is decorated with a fuzzy bear from Alaska, a buffalo from Mount Rushmore, a pretty hand painted ball ornament with a scuba diver from St Thomas and an official Plaza Hotel ornament. 3. My daughters learned early on that books were the one thing mom would buy them so we have many books and many Christmas books full of wonderful stories. Golden books, pop up books, classics, poetry and gift books – A Cup of Christmas Tree, God with Us, The legend of the Christmas Prayer, What does Christmas Sound Like?, A Family Christmas, and The Legend of The Three Trees to name a few. A few years ago I didn’t put the little kid books out and Meghan commented “what happened to the kiddie books? I still like to look through them.” Thus why the kiddie Christmas books are still displayed. 4. 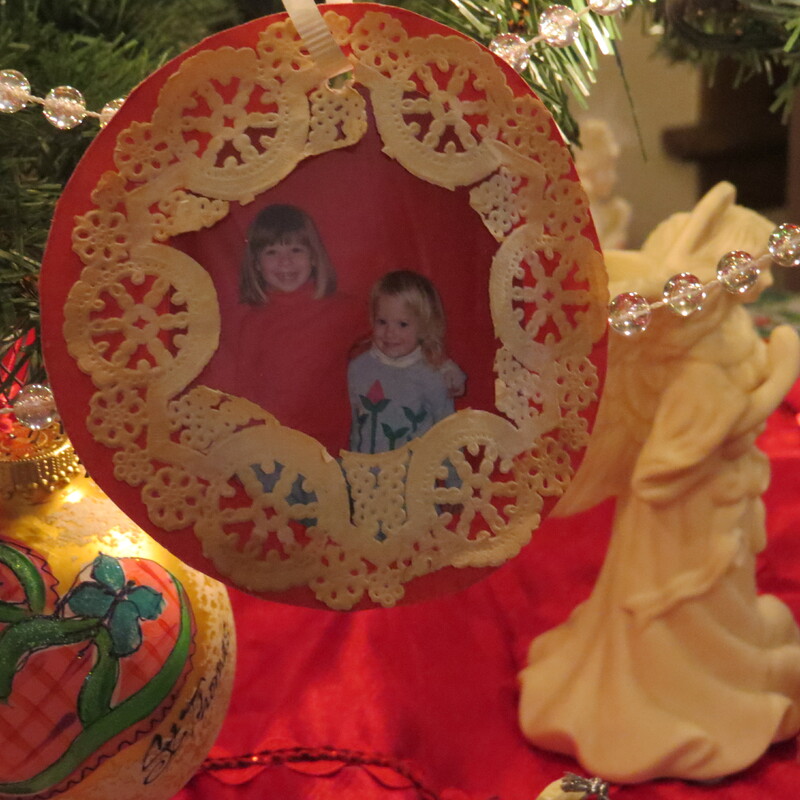 By far the best Christmas decorations are those made with paper, glue and a photo of those you love. For those decorations come with a lifetime of stories. My Dad loved decorating for Christmas. What made that so funny was that my Dad was a very well read, logical thinker, he was an electrical engineer by profession but he delighted in the wonder of Christmas. He had his Dickens village that was historically correct in the placement of the buildings. No really, it was. He always hanging stuff from the ceiling especially geometric shaped ornaments. He had wildlife ornaments hanging from every indoor plant. He would take a break from decorating to scatter wild bird seed in the backyard for his bird friends. There was a nativity on the mantle. 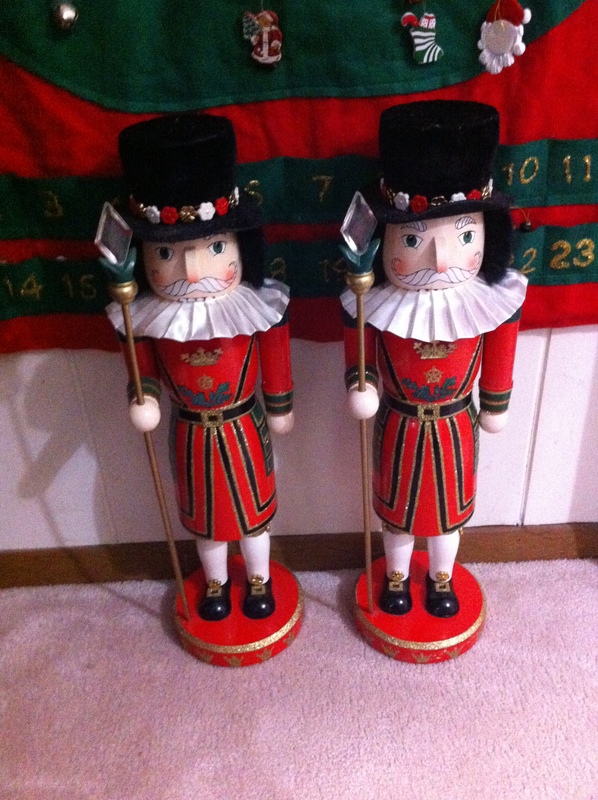 Byer’s carolers on the end table. A carousel of musical animals on top of the hutch. He was never done. To quote my daughter “it looks like Christmas threw up at Nanny and Poppy’s house”. The Christmases of my childhood were full of wonder due to my Dad decorating and decorating some more. And when he was done he would build a fire, sit on the couch with my mum and enjoy a snifter of brandy. Thanks Daddy for instilling in me the wonder of life, the power of knowledge and the love of family. It appears to be a homemade Christmas ornament – a glass ball containing some kind of gold substance with a gold ribbon hot glued around the circumference. It is however an amazing story of an acquaintance being in the right place at the right time. It is a story of a one of a kind gift. In the Spring of 2011, a friend would contact me stating that someone was trying to contact me and asking permission to forward my contact information to said person. I said “sure”. On Easter Saturday that someone would call and ask to stop by. They had something they knew I would want. My daughter and son-in-law were visiting. We were all slightly curious and a little skeptical so we said “fine, stop by”. The someone and his wife arrived carrying a plain brown box and a DVD. We invited them in and he proceeded to tell us about the contents of the box and the DVD. Before he started to speak his wife commented “watching the DVD was like watching grass grow”. Okay?!? He opened the box and it contained a plastic bag of metal shavings. Strange?!? 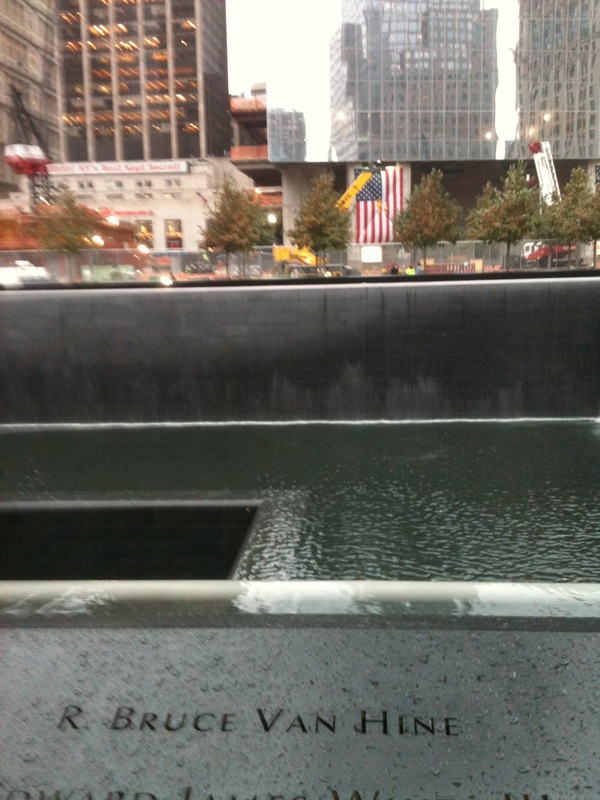 And then he told us “I have been working at the company that is engraving the panels for the September 11 Memorial. I was working the day they engraved Bruce’s name. These are the shavings from his name being engraved. I also took a video of his name being engraved. You can’t show this to anyone until after the panels are installed” Oh my, I was amazed and ashamed of my attitude and dumfounded. Wow!! 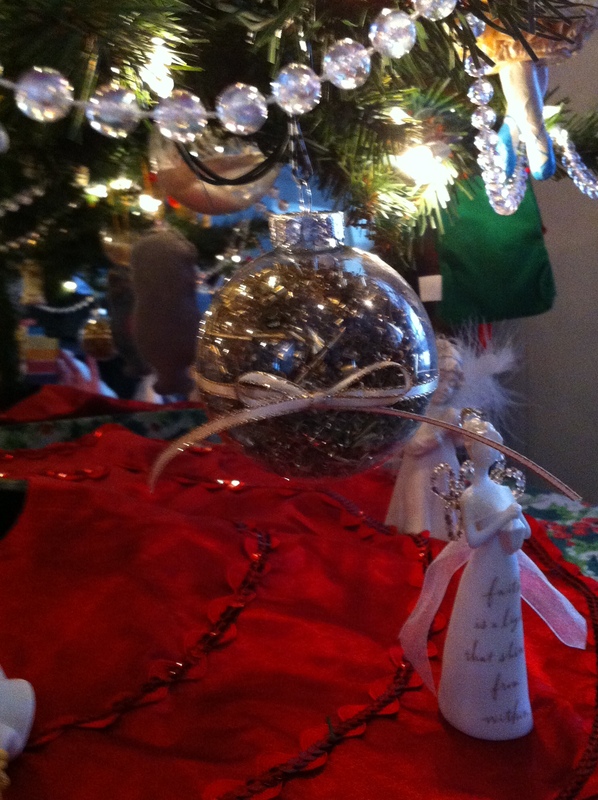 In December of 2011, my daughter and I filled 3 glass balls with those shavings and glued a ribbon around the circumference. We made one for me and one for each of my daughters. That ornament hangs on my tree (and their trees) and I am ever reminded of how God uses everything to remind us of His love.